This hospital is a 120 plus bed private facility in Central QLD. This stand alone facility is located in the heart of Central Queensland; This area offers an exceptional standard of living with access to exceptional schooling and close to the beach for a weekend away. This Hospital performs a range of surgical specialties including interventional cardiology, vascular, orthopaedics, neuro, colorectal, general, urological, gynae, plastics, ophthalmology and ENT. Surgical services and are set for further expansion in the next 12 months. The Hospital has opportunities for General Practitioners/Medical Officers in a new role to the hospital. The Hospital CMO will provide initial clinical support 24/7 to the Rapid Access Heart Centre (RAHC) and further support the busy team of admitting consultants. This role is further supported by onsite 24/7 MET team which includes a ICU RMO. To find out more information in relation to this position please don't hesitate to call or email me on . Applications from Candidates without General Registration with APRHA will not be considered. Frontline Health is a trusted advisor and recruitment partner to the Healthcare sector in Australia. We recognise that our role is to work closely with our clients and candidates (Hospitals, Aged Care, Not-For-Profit, Community organisations etc) to help secure outstanding talent with the appropriate skill set and fit. With locally run offices currently in Brisbane, Sydney, Melbourne and Perth, we are able to offer you exceptional service at a National level with local expertise and knowledge of the Healthcare market. 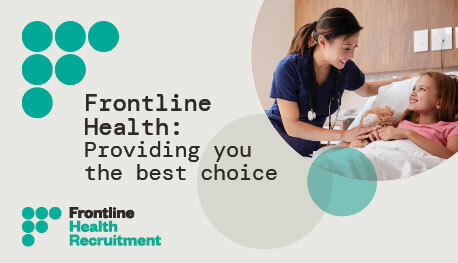 Front of Mind, Frontline Health - specialist recruiters to the healthcare industry.